Do You Have Retirement Savings in the Bank or Money Market Mutual Funds? You may have retired with substantial savings, but depending on where you keep these funds, you could be losing thousands of dollars in interest income. Hopefully, this doesn’t come as a shock. But where you save is just as important as how much you save. You can no longer afford to be casual about it. That’s why this page is specifically addressed to members of the Trinidad and Tobago Association of Retired Persons as well as non-TTARP retirees. As a retiree, you can start earning valuable interest income on your savings by making a decision to move your money to the highest earning fixed deposit available in the market. This fixed deposit will pay you between 3% and 3.75% on terms of one to five years. And the only Central Bank-licensed financial institution that offers you this opportunity right now is Development Finance. The next few paragraphs will explain why a DFL fixed deposit is the right investment for your short-term cash compared with money market mutual funds and regular savings accounts. 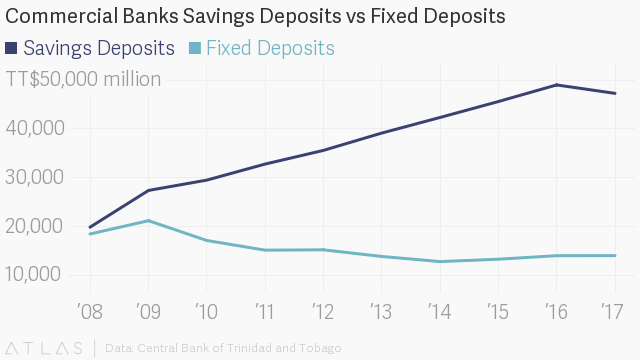 For starters, fixed deposits routinely outperform regular savings accounts which have seen historically low interest rates of less than one percent over the past nine years. Compare that low yield with a DFL fixed deposit that pays upward of 3% and it’s clear the money you have in the bank isn’t working for you. In fact, the only people earning money on the money you keep in these low-yield savings accounts are your bank’s shareholders. If that isn’t bad enough, inflation takes another bite out of the purchasing power of your money the longer you leave it there. So between low interest, inflation and bank fees, you may actually be losing money at a faster clip than you realise. Still, it’s not lost on us why banks are sticky. Even for people who really hate banks. Some people just like the convenience of a branch close to where they live, but already major banks have started closing branches and scaling back traditional services. For most of us, though, it’s just easier to complain about poor service and poor returns than it is to close the account. Whatever the reason, a regular savings account should have just enough cash to meet monthly expenses and handle minor emergencies. That’s why most of them come with a LINX card—for 24/7 access to your money (even if they charge you another tidy fee for it). But it’s not the place to save or park money you don’t plan to touch under a year. Yet data from the Central Bank shows the amount of money lying idle in savings accounts at commercial banks at the end of 2017 was TT$47.3 billion dollars. That is a lot more than the TT$14 billion people have in interest-earning fixed or "time" deposits, and it likely includes the retirement savings of thousands of passive savers who are content to just leave the money in a bank. These passive savers are retirees who, over the course of their careers, worked hard and built a nest egg to pay off their mortgage and enjoy a comfortable retirement. They were smart enough to start saving early, putting aside Christmas bonuses and back pay, living simple, dignified lives for the sake of their children. But almost by reflex they tucked most of this money away in some savings account they opened 30-odd years ago. They are passive savers because by leaving the majority of their investable cash in a regular savings or checking account they miss out on market opportunities to make that cash work for them. They won’t touch their own money except for the most dire emergency. And they won’t move the money even though leaving it where it is earns them nothing. Somehow they have peace of mind knowing the money they saved all those years is just—there. But this is precisely how retirees miss opportunities to grow their nest egg through interest income. Because they don’t realise that just having money in the bank isn’t the point. But maybe you thought this through and considered multiple investments in your retirement planning. And the balance of risk and reward in your portfolio led you to mutual funds. Good move. Mutual funds should be an important part of your portfolio as you become a more seasoned investor with a larger appetite for risk. But it’s important as a retiree that you understand how mutual funds stack up against fixed deposits when considering your cash needs over the short term, say one to five years. The first point is that a fixed deposit like DFL’s exclusive 3% plus offer outperforms most local mutual funds when you look at fund performance. In fact, one of the leading commercial bank money market mutual funds had average annualised returns over three years of 1.59%. Even lower over five years at 1.3%. It’s Income Fund did much better—2.74% on TT-dollar investments over three years and 2.46% over five years. Still, with rates between 3% and 3.75%, a DFL fixed deposit pays you more. The interest rate on any of these money market mutual funds isn’t guaranteed up front like a fixed deposit. Yet another important distinction is that any money you set aside in a fixed deposit up to TT$125,000 is fully covered by deposit insurance. Having money in the bank isn't the point. Growing your money is. But mutual funds managed by leading mutual fund companies and other banks can represent an increased investment risk because, for one thing, your money doesn’t enjoy the protection of the Deposit Insurance Corporation of Trinidad and Tobago. Can you make money on mutual funds? Sure, when the fund has a few good years. But you can also lose money. That's not the case with a fixed deposit where you will always get a return on your money as long as you don’t touch the funds during the investment period. You may be tempted to just look at income and growth mutual funds that occasionally report returns as high as five or six percent or more. But don’t be fooled, fixed deposits don’t come with the inherent risks associated with income and growth mutual funds. You also have to remember that some mutual funds have significant investments in equities which, like any investment in stocks, means they are extremely susceptible to weakness in the economy. This is another reason why certificates of deposit—or fixed deposits as we call them—ought to be included in your retirement income mix. Because not only do fixed deposits offer competitive five-year returns; by guaranteeing these returns they give you a hedge against a faltering economy. It’s retirees who are passive saver types who are prone to ignore opportunities in the market to grow retirement income. The passive saver gets complacent; he leaves his money in low interest accounts choosing what’s familiar over what’s financially sound. But then there are the active saver types who pay attention to the market. They are retirees who were also ambitious, relentless workers who had big dreams about the future they wanted for themselves and their family. Serious and consistent, they amassed surprisingly hefty savings. But there is something noticeably different about how they handle their money. Many of them tend to divvy up their retirement savings across multiple financial institutions because they are always looking for a good return on investment. While passive saver retirees are only really interested in securing the funds they saved—what you could call return of capital—active saver retirees care as much about return on capital as they do about protecting their original investment. What really gets them excited is a statement showing their funds grew by several thousands in interest alone. They aren’t satisfied merely by assurances that their principal is safe. They don’t derive peace of mind from watching their money. They get peace of mind from watching their money grow. They are active savers because they pay attention to the market and will move their money around the minute interest rates become more generous. In our experience, the retiree who actively seeks to take advantage of these kinds of opportunities without taking foolish risks builds significantly more wealth over time than her more passive counterpart. So the question you have to ask yourself is whether you are a passive saver or an active saver? And what exactly sets active savers apart from passive types? Well, it has nothing to do with how hard these retirees worked over the course of their careers. No, the difference lies in what each knows and how they make use of that knowledge. Active saver retirees routinely have more knowledge about the market and about how money works. So they are always interested in return on capital. Unlike passive retirees who ignore the interest income part of their portfolio to their detriment. The only way forward, if you are retired, is to stay nimble where your income is concerned. You can’t be content with having saved some money. Never settle for what you saved. It’s about earning interest income, which you can do right now if you move any long-term savings you have in low interest bank accounts or underperforming mutual funds to a DFL fixed deposit that will pay you between 3% and 3.75% over one to five years. All it would take to start is clicking the OPEN MY FIXED DEPOSIT button below or calling 800-4DFL to set up an appointment. When we sit down there will be no fine print to squint at. Just a few forms to sign and you will be on your way to boosting your retirement income risk free through the magic of compound interest and deposit insurance. And simple math says if you were to invest $50,000 for five years in a DFL fixed deposit earning interest of 3.75% over the period, you would add $10,105 to your savings through yearly compounding. Simple math says that if you left that $60,105 untouched for another five years your savings would jump to $72,252 after compound interest. That’s an additional $12,147 you didn’t have to find yourself. You can appreciate why rich people love compound interest. It’s because of how quickly the money adds up. On a $500,000 investment, for example, the money you’d earn in interest alone over five years is $101,050. Fixed deposits aren’t exactly complex financial instruments yet they can outperform both regular savings and mutual funds, which could be up today and down tomorrow. Remember, it's about the knowledge you have and what you do with it. So call or click on that button now to open your fixed deposit. Then use this tool to see what your future earnings will look like.